This book #6 in the Diane Fallen series. If you have never read Beverly Connors books before please do. Start with #1" One Grave Too Many". 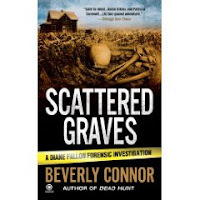 Shattered Graves follows the main character forensic anthropologist Diane Fallon as she and her team at the crime lab in RiverTrail Museum of Natural History try to find out who killed the mayor and police chief, who were harassing her and were hiding secrets of their own. I love the character of Fallon. And if you enjoy this series you will also love Ms. Connors other series that has the main character Lindsay Chamberlain an archeologist.